1. Very quiet when shooting. 2. Extremely smooth shot and feel. 3. Comes stock with Auto Trigger feature. 1. Only comes with a 3 piece barrel kit. 2. Not many upgrades available for it. 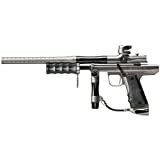 The Empire Sniper paintball gun is Empire’s tournament level pump gun. The gun is based on the famous work of WGP and their Snipers. Empire wanted to give people a gun that will be able to compete with others that cost hundreds of dollar more. It is designed from the ground up by Empire for the best performance. It is a pump gun so in the right hands it’s deadly. It is built for recreational play and usage in pump tournaments. Due to the use of Aluminum it is very light in the hands. The Sniper is a great gun on the field. It’s very quiet on the field and is great for sneaking around. The gun is very light due to the well done milling job. The pump stroke on this gun is nearly as good as a CCM or a Bob Long MVP. The efficiency is very good, and it fires fast enough to justify an electric loader. The Sniper comes tuned out of the box for peak performance. The only things you should ever need to do are clean the bolt and lube it. You can also adjust the hammer lug to decide when the trigger will let the hammer fire. You should also take out and lube the regulator every 5 cases. 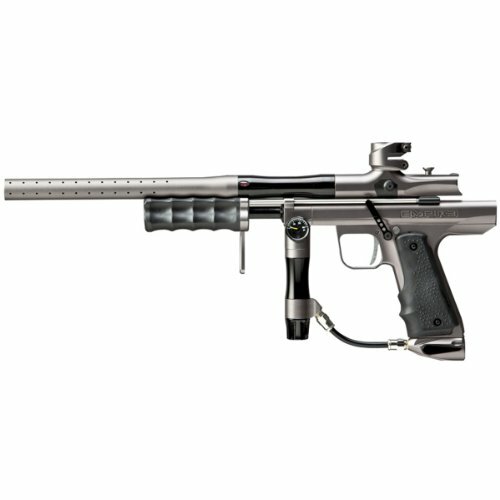 The gun only comes in silver and black at this time. It comes with a low pro feed neck with twist knob clamp. It also ships with a 3 piece barrel so you can fit the paint perfectly to the barrel. The gun has a well-tuned hinge auto trigger to keep your fire going. Another feature is the Delrin bolt which is very light and fast moving. The pump is also made of Delrin to cut down on weight. The pump also has a hitman mod so you can hold the regulator and pump the pump at the same time. Some tips for tuning is to leave the IVG out and to tune through the regulator. This will give you a softer shot and will be better on paint. Also lubing the bolt will allow for a smoother and quieter shot. You can also lube the pump rod for a better pump stroke. Also when shooting is for a quieter shot don’t hold the pump handle forward when firing, this allows the valve to stay open long and not cut of the air mid firing. By doing this you will also stop the farting sound when firing. TechT Hush Bolt for Empire Sniper: This is an upgraded bolt still made of Delrin but the way it is designed allows for quieter sound when firing. CP Reg Extender: This is used between your tank and your ASA if you feel your tank is to short this is good because more length will let you run and gun better. It’s also great if you don’t want to buy a whole new tank. Exalt Reg Grip: When playing your hand will get sweaty and may slip of the Reg the Exalt Reg grip is made of rubber so your hand wonât slip even when wet.